I hear it all the time — ‘This photo tells a story.’ No. No, it doesn’t. No single photograph can possibly tell a story. A story has a beginning, a middle, and an end. A single photograph can be any one of those, but it can’t be all three. A single photo can only suggest a story. Part of the mystery of a good photograph is trying to decide what part of the story you’re seeing. 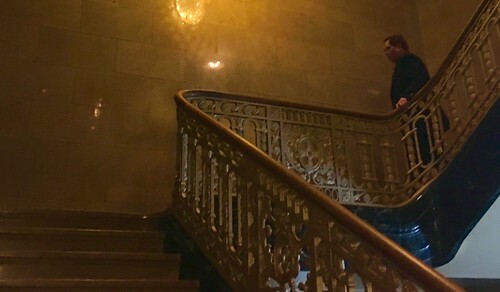 This guy coming down the stairway — is this the beginning of a story? The middle? Near the end? Maybe at the bottom of the stairway he’ll get drawn into a tragedy. Or an adventure. Maybe he’s already in the adventure; maybe he’s running down the stairs to get away from somebody. Or something. Or maybe he’s made a difficult decision and he’s walking grimly down the stairs to deliver it, knowing it will change lives. Or maybe his story is almost over. Maybe the police are waiting for him at the bottom of the stairs. Or maybe it’s the love of his life who’s waiting. Or maybe there’s nobody waiting for him, maybe that’s the end of the story. Maybe he’s just going to get to the bottom of the stairs, walk out the door, and keep on walking. This photograph doesn’t tell a story. It does more than that. It implies a thousand different stories.